Axis Fairs & Services S.r.l. 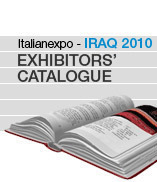 The trade fair that has become a privileged gateway for Italian companies wishing to do business in Iraq is now in its third year. This is the first event organized by a European company in Iraq (Kurdistan) to bypass go-betweens and start up direct contacts with producers. The first trade fair event dedicated to those Italian companies who have perceived the potential of Vietnam. A country whose economic growth rate is one of the highest in the world and is considered one of the states with the best economic prospects for the next ten years.